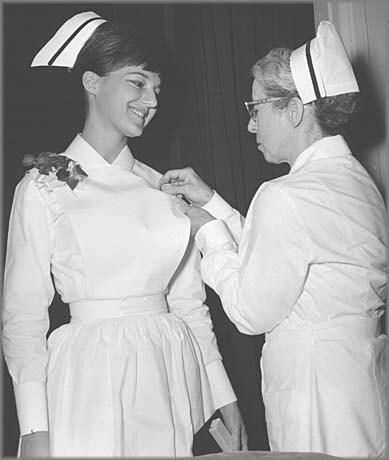 The evolution in the design of nurses' caps, from nun's coif, to no cap, reflects the history of nursing in Canada. The first nurses to come to Canada from Europe were nuns. The Hospitalières, a Roman Catholic nursing order, arrived in Quebec in 1639 to establish a medical mission that expanded to become the Hôtel-Dieu. They introduced the first formal apprenticeship training in nursing in North America. Nursing nuns had no special headdress for nursing, but wore the coifs that were part of their habit. The nun's coif would come to influence the design of both religious and secular nursing. The British colonies did not have the organized approach to health care that New France had. Nursing was done informally by female family members, with the occasional consultation by a physician. The few hospitals employed charwomen who provided patients with rudimentary health care. While they often brought useful experience to their work, they were often viewed as slovenly, lazy and drunken. Whether these women worked in patients' homes, or in hospitals, they wore their everyday clothes. Most working women at that time wore a white cap, but there was no special "nursing" cap. A revolution in medical practice by the mid-nineteenth century had a profound effect on nursing. At the same time, Florence Nightingale developed a system to train "respectable" women in nursing, which served as a model in English Canada. The first nurse training programme based on the hospital apprenticeship model was established in 1874 at the Mack Training School for Nurses in St. Catharines, Ontario. Nurses who graduated from these training programmes, were, for the first time, required to wear uniforms to distinguish them from their untrained competitors. 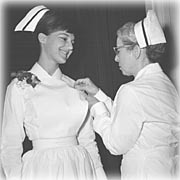 Upon graduation, the nurse received her graduate pin and cap with black band. Compare the new-style cap worn by the graduate with the original style cap worn by the nursing school principal.